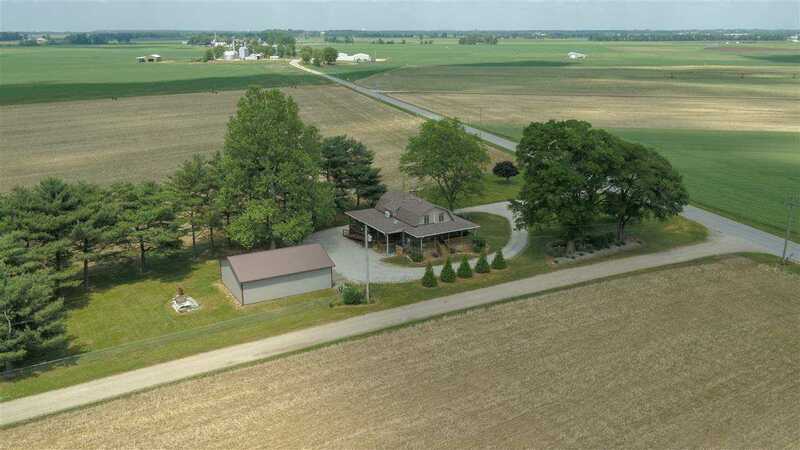 This wonderful Log home sits on 1.69 Acres just 5 miles West of Vincennes and less than 30 minutes from Toyota. When stepping out the back door you will find yourself on an oversized covered wraparound porch. You will love the 36 x 40 insulated pole barn with an attached dog kennel and fenced back yard. The main level of home offers a warm and inviting kitchen / dining room as well as an extra large living room with a fireplace. There is also a den on the main floor that you could convert over to a guest bedroom. The windows all across the front of the home provide you with a beautiful view across the country side. The very large bathroom on the main level has been turned into a 1/2 bath but can very easily be converted back to a full bath as the plumbing is located under the flooring. Upstairs you will find 3 or 4 bedrooms. Home has solid six panel doors as well as a full basement that includes a Water proofing system, a new full bath, fireplace, rec room, and workshop. Family is Motivated to receive a Buyer. Many improvements have been completed since it originally listed. Mineral Rights are included. Directions:From Willow and Sixth Go West for 5 miles. Home on the Right. SchoolsClick map icons below to view information for schools near 4593 S 6th Street Road Vincennes, IN 47591.